Your queen looks very much like this Dorymyrmex bicolor queen, whose workers look almost identical in shape to Argentine ants. 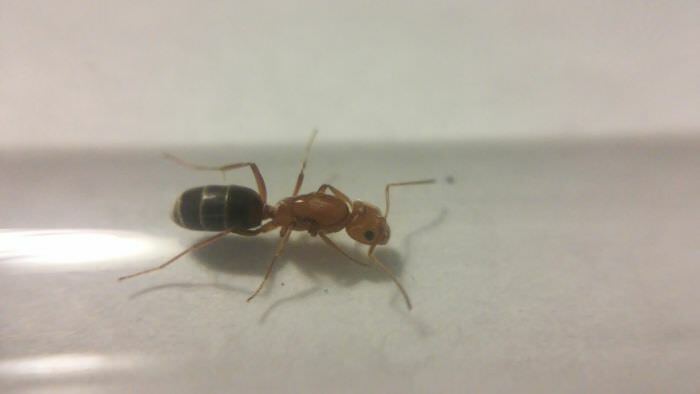 the Argentine queen does have a similar body shape to Antmanmikes queens and the worker looks identical too. I need better pics cause it’s really hard to tell from this picture. Dude but compare his queen’s color to the Argentine ant. Their colors are nothing alik. Dorymyrmex are known to be similar in shape but the color gives it away. sorry i didn't see your post when i sent that one. Also if the location of that ant has anything to do with the name, its probably not it. Also, can you put any close up pictures of the workers so I can identify them? maby its an Asian needle ant, or Brachyponera chinensis. Nope. A quick Google search will tell you it isn't. Looks more like some nylanderia sp.